Both trees were relocated to different parts of the garden and we added a drip irrigation system. Now one would think figs need little to no water but as I learned last week from the farmers at Valley Fig in Fresno, during the fig production phase, the plants do need a little water to let the figs get sweet and juicy. The trees do well in high heat and bad soil but they do need some source of water. It's made all the difference in the world, the fruit have started to ripen and they're sweet and jammy on the inside. I've been eating a lot of weeks on a weekly basis, it is a short season and I've been making this fig jam that has a bit of pomegranate molasses, cardamom and black pepper. It goes well with cold unsalted butter on toast sprinkled with a few salt flakes on toast and of course, a good addition to a cheese board. The pomegranate molasses adds an extra layer of fruitiness and brightens up the vibrant red color of the jam while the cardamom adds a beautiful cool aroma and the pepper a bit of mild heat. I can't believe that we're only a few weeks away from launch date. 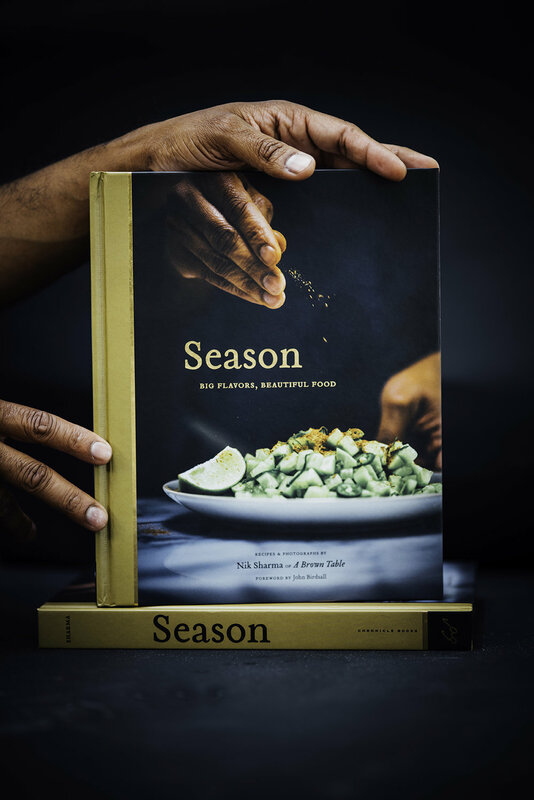 Season just made it to it's first international cookbook list at the UK's Evening Standard as well as on Mind Body and Green Top Healthy Cookbooks of Fall 2018. And celebrated cookbook author and chef, Yotam Ottolenghi just gave my book the most generous and kind shoutout this week (which blew me away)! Here are the latest updates for my book tour that kicks off in San Francisco! 1. October 2: Omnivore Books, San Francisco with John Birdsall in San Francisco at 6:30pm. No purchase necessary to attend. 2. October 4: Camino Restaurant, Oakland - Dinner Party at 6pm. Details on the event and tickets can be purchased here. 3. October 20: CUESA Demo followed by book signing at Book Passage: San Francisco at 2pm . No purchase necessary to attend. 1. Rinse the figs under cold running tap water to remove any dirt. Place them on a clean towel to dry. Trim the stalks of the figs and cut the fruit in half across their length. Place them in a medium thick bottomed saucepan. Sprinkle the sugar over the figs, toss to coat evenly and cover with a lid and let it sit for 1 hour at room temperature. 2. After 1 hour, place the saucepan on a stove and heat on high. Add the pomegranate molasses, lemon juice, pepper and cardamom and stir with spatula. Bring the contents to a boil, then reduce the heat to low, cook for 45 minutes, until the liquid gets thick. Take a spoon and coat the back of the spoon with the jam, run your finger through it to leave a trail. If the trail stays, the jam is ready to remove off the stove. 3. Remove the saucepan off the stove and divide the jam equally between four clean and sterile, 500mL canning jars. Process as per your altitude requirements. If you do not want to can the jam, then freeze the jam for a month in the freezer, once opened and thawed the jam will be good for one week in the refrigerator. Note: If you like it a bit extra peppery bump up the amount of 1 Tbsp, I find this better when the jam is to be served with cheese.